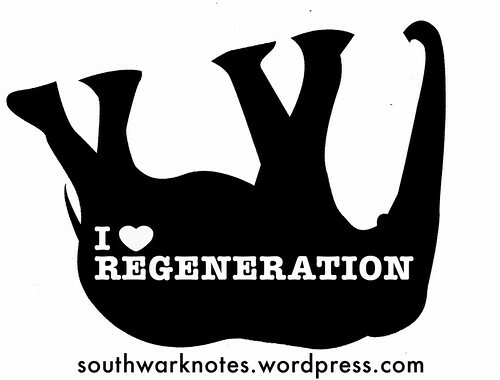 Regeneration | Southwark Notes - whose regeneration? As long-standing critics of some but not all of Southwark Council’s policies towards housing development, we happen to spend some of our free time on Twitter sharing to others our criticisms and using the platform as a small tool in the campaigning we do. We also spend a lot of time researching things, writing them up on this blog and also being active in the streets and estates. In recent years, we’ve been particularly involved in different ways in campaigning at The Elephant & Castle Shopping Centre and also on Aylesbury Estate. 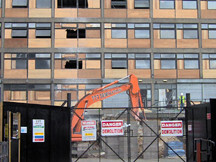 Southwark Council is very keen for demolition and what they would call ‘regeneration’ of both those sites. Sometimes we have engaged in small Twitter conversations with the Leader of Southwark Council, Peter John O.B.E. Although Twitter can be much of muchness, it is still a public forum and so these conversations are part of the public debate around what the Council does and the effect it has on local communities. Peter John – Gone Fishing?! In 2016, we wrote up the whole sorry saga of how three rounds of ‘regeneration’ on Elmington Estate in Camberwell had left the estate with 346 less council homes after it’s development by Notting Hill Housing Association and later by private company Bellway Homes. In November we exchanged Tweets with Peter John about his news that Southwark was going to build 11,000 new council homes by 2043. We questioned him about the then demolition of 144 Council homes on Elmington saying that ‘no council homes replace these for displaced tenants’. He replied ‘Council tenants prioritised for rehousing in better accommodation – new social housing delivered at Elmington’. We then questioned this: ‘144 council homes gone – replaced by 130 private, 36 shared ownership but only 38 social housing. Some priority!’. Even if there was a Right To Return, which wasn’t certain, we asked ‘Where do all the 113 tenant households displaced by demolition return to then if only 38 new social homes?’. Peter then replied ‘I don’t know but will look into it. Thanks for raising’. Ok, so far, so good – a fairly civil public conversation with an elected politician who makes a promise to look into it. We prompted again in December 2016 and again in February 2017 but we are still waiting for a reply from Peter about it. Researchers have found that the Help To Buy scheme does not necessarily increase house building but certainly the subsidy means that large volume building companies like Bellway are inflating the sale price of new build homes on the back of the scheme. A small flat that has one bedroom and combined kitchen and living area starts at £379,995. Once again, the profits are privatised and sit in Bellways and their shareholders coffers and the risk is nationalised with taxpayers money*. Peter John – Gone Fishing Some More?! Jump to December 2018 where the Up The Elephant campaign was a couple of years into fighting for the Elephant community. The campaign has been fighting the dismal plans of Delancey to replace the Elephant & Castle Shopping Centre with close to 1000 new homes. As part of that long campaign, Up The Elephant had managed to pressure Delancey to increase the number of social rented units from 33 to 116. Without that pressure, the pitifully low number of actually-affordable homes would have stayed at 33. The Council planning officers had no qualms about recommending the Delancey plan for approval in July 2018. In a somewhat aggressive Twitter argument with some other people questioning the Council’s wisdom on this scheme, Peter John wrote ‘And those who have bizarrely opposed the development of the shopping centre – where no housing currently exists – and have therefore opposed the delivery of new social and affordable housing need to explain themselves. I can’t’. We wonder if you have any proof of this? Or is it actually not true? As far as we can see the various and numerous campaigns against parts of the Delancey scheme have only ever publicly campaigned for more genuinely affordable housing in the scheme. In fact, despite the Council recommending to pass the scheme earlier in the year with only 33 social rented homes, pressure on Delancey from campaigns resulted in them seeking GLA finance to increase this figure to a possible 116 social rented homes. Not only this but there has been some indications that Delancey may consider offering these homes to Southwark to run as council homes. That would be welcome if this could happen. You may be able to see why campaigns get frustrated when there is no actual recognition of the work they do for free in their spare time which actually increased benefits to local people at The Elephant. 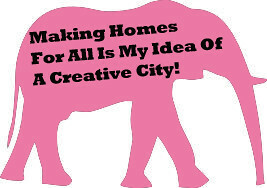 That campaign work is exactly the sort of pressure the Council should be putting itself on developers because there are benefits to taking a harder line especially where this is backed up by a strong local campaign such as Up The Elephant. What Does Public Accountability Look Like To A Community? Peter is not a big Twitter user and each to their own. But there is something to be said that if you reply on a thread to Southwark Notes, you are also replying to every one of our 4896 followers and so that makes any conversation a public moment. Not only that but many of those followers are local people or local campaigns who take an interest in both what the Council is doing and what it is saying to justify those actions. It takes a special sort of behaviour to decide to call out campaigns like us and Up The Elephant in public but then not remain in anyway accountable to those statements when the local campaigns say to you ‘ Hey! Wait a moment. That’s just not true!!’. But hey, that’s politicians for you, no? It’s a special way of being. As we have said before here, when we say The Council we know it is made up of both a workforce as well as a bunch of executive officers and councilors. But Peter John, as Council Leader, wields a special political power in a way that many council officers and workers don’t. His own political ideas and beliefs go a long way in making things happen in the borough especially in the realm of housing and regeneration. A large task of his job is also then to be accountable to local people who make questions on these political ideas and actions. In relation to our little Bellway homes tale above, it’s clear that government policies favour both massive profits for house builders and landlords, the knock-on effect of high houses prices being that buy-to-let landlords can pick and choose tenants and increase rents every six months because most people can’t afford to buy a new home and have to rent. Peter John insists that, and we quote verbatim, ‘in a housing crisis the way to solve a housing crisis is to build new homes‘, misunderstanding that the real crisis is of a lack of affordable homes and not the myth of lack of available homes. * There is a useful summary of the Help To Buy scam in Chapter One of Danny Dorling’s readable book ‘All That Is Solid: How the Great Housing Disaster Defines Our Times, and What We Can Do About It‘. The Curious Case of The Heygate Estate, Hej Coffee And A Hey Presto! Posted on September 10, 2018 | Comments Off on The Curious Case of The Heygate Estate, Hej Coffee And A Hey Presto! As ‘people who sit in the dark typing things by themselves’, we are happy to shine a light on the real and marvelous history of The Curious Case of Hej Coffee and The Heygate Photo. The video is fronted by Joanna, a black barista working at Hej Coffee (pronounced Hey! as in Hey-gate!). At the time we commented that although we had ‘massive respect to Joanna as a local worker’, it was ‘utterly tragic the actual disconnect between the words and the pictures in the promo video and the actual reality of the social cleansing of The Elephant’. By disconnect we meant that the script of the video talks about the customers being ‘diverse’, ‘variety’, ‘all sorts of people’, ‘everyone’s different’ but actually everyone in the video wasn’t different or diverse but were all white 20-somethings. So it’s a typical whitewashing of a local London area that is a massively mixed and great community. In Heygate’s hey day it even had about 3000 working class people living around where the Hej Cafe stands. This isn’t the first time this goes on locally and probably won’t be the last. In fact, this week Notting Hill Housing who are developing the Manor Place depot site put up hoardings with very much more of the same – a barren but stylishly chic café with only white people in it and yet bearing the text ‘Hola!’ and three spicy chillis! You could argue that these regeneration images are just identikit nonsense, badly thought through or you could argue that’s it’s deliberate. We edge towards the latter. Of course, it’s not our argument that we want a more inclusive gentrification! Gentrification will only ever be exclusive along class and race lines – that’s how it works. Black people rarely get ‘included’ in these ‘indicative CGI’ pictures of forthcoming developments because images of smug white coffee slurpers are used to sell the new-builds to exactly those smug white coffee slurpers. Creating a terrain of whiteness means that these hoardings are like all those other unsubtle codes that racialise everyday life – white people indicate safety, white people indicate networking and getting on, upward mobility, white people indicate taste and style, beauty and desirability. To be honest, it’s sickening. So, this was our first criticism directed at Hej Coffee. A few days later we heard that Hej Coffee had put on its wall a large artistic photo of the Heygate Estate as part of the décor. It’s a pretty photo, carefully taken in 2010, a symmetrical presentation of an empty estate. Hej Coffee was very proud of the photo and Tweeted out its installation in the café by the picture’s taker Simon Kennedy, an architectural photographer and lecturer at University College of London’s Bartlett school. As people who were heavily involved in the last years of the struggles against the demolition of Heygate we wondered what it meant for a new café, an intimate part of the gentrification of the area, to want to display a photo of the Heygate albeit one especially chosen for its abstracted sense of the estate blocks. So we dropped some lines to Hej Coffee about this saying things like ‘don’t think many customers understand the long messy and scandalous history of the demolition of the Heygate. It’s certainly not a good look for the Hej cafe. Bit insensitive given that the Heygate scandal has not gone away for many local people’ and posting up photos we took in 2011 of the old Wingrave blocks. Hej Coffee replies were never on the subject of the criticism and only about coming in for a coffee to chat about it. In fact the more we and then other people commented the more they made invites (with cute emojis) – ‘We need more people to come in to drink more coffee and know more things…not to be sitting in the dark typing things by themselves’. Nice one! Anyhow, then it all becomes a bit confusing. Either Hej Coffee or someone else made a leaflet for a discussion night at Hej Coffee on Friday 7th September about Hej and the Heygate. This then caused another round of online back and forth. Hej Coffee said they hadn’t made the flyer but were happy for a discussion to go ahead. AND THEN AS IF BY MAGIC – HEY PRESTO! For us lot, although Simon Kennedy’s picture shows an empty estate and might therefore represent some kind of symbolic commentary on the political processes around the ‘regeneration’ and demolition of the Heygate buildings and community, we thought that there’s something less than sincere in the representation and in its display in a café that is only situated where it is because of that social cleansing process. Despite its neat portrayal of vacancy, at the time the photo was taken in 2010 there were still many households living on the estate and there was a huge range of people doing stuff in the estate’s public spaces to highlight it. We were there too being a part of the allotments, the film screenings, the public exhibitions on the scandal of the decant, the chicken keeping, hosting visits for school kids and students, leading anti-gentrification walks and supporting all the remaining residents in their struggle for decent rehousing or fair compensation. Any road up, were were umming and arrrghing about whether to go the event or not. We do not relish liberal dialogues in gentrified spaces where any anger or pointed criticism gets washed out by scene and setting. But on the day of the event, Hej Coffee took down the Heygate photo and wrote ‘whilst we never intended any offence or insensitivity by displaying art, we have listened to your comments and have taken the photo down’. It wasn’t any old ‘art’ that was seen as offensive and serving the politics of gentrification, but Hej Coffee could not at this point seem to bear to name it. Whatever! The Heygate photo was gone, decanted to some other unmapped place. By way of a small finale, we want to add some things in about gentrification, community and coffee shops. It would be a kind of foolishness to equate expensive coffee shops with some kind of enemy. Hej Coffee, like others appearing in the neighbourhood, are the product of gentrification and not the cause. Although we don’t particularly like the kind of expense, vibe and disposition of such places, it would be stupid to centre our entire political life on opposing them. Campaigns against ‘yuppies’ in the 80’s and against ‘hipsters’ now rarely have any potential for actual community organising and they seemingly don’t have much longevity! In the same weeks that this mini-soap opera was playing out with us, Hej Coffee and others, we were more usefully spending our time being part of the local campaigns against the demolition of the Shopping Centre and of the Aylesbury estate, because opposing these is opposing the much larger forces at play – that’s national and local government-supported gentrification dressed up as ‘regeneration’. 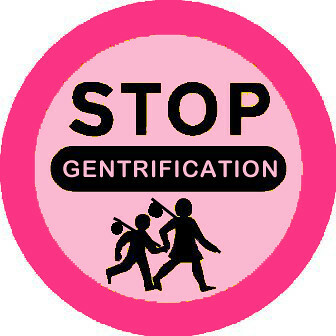 Having said this, there are many communities in the world who are militantly against the arrival of gentrifying businesses as they are part of the signal that it’s okay for developers and speculators to colonise ever greater chunks of our cities for their bloody-minded profit-seeking schemes, while low-income residents get stomped over or cast aside. In Boyle Heights in L.A, a Latin@ neighbourhood with a decades long struggle for public housing and against the social and ethnic cleansing of their area, parts of that community are targeting new business such as cafes or art galleries that are a sign of the violent gentrification of their area. Those struggles are enacted by a community that recognises itself as such – as poor and as Latin@ – and who are fighting from the basis of that self-identification. We would say that in London the debate and action around these questions has not been so clear. Of course, it’s London and not L.A and each anti-gentrification struggle is different but it would be good to see some discussion here about how to think and link different parts of the ‘regeneration’ process – global development and real estate, investment and construction, demolition and displacement with the ‘uplifting’ of areas, luxury flats and more expensive shops, lifestyle values and displays. But let’s not mistake one for the other. White coffee slurpers have little power over any of this, the same as the rest of us. We need to be clear also that many (but not all) people living in gentrifying areas are likely to be as precarious in their housing situation (low wages and expensive rents), even in new developments like Elephant Park. Then of course, there are the rich folks buying into the area and so what role do they play? So far, locally, they do not really organise as a lobby to boost more ‘regeneration’ although London is seeing a rise of Yes In My Back Yard (YIMBY) groups who are dubious in their support for more and more new gentrifying developments. 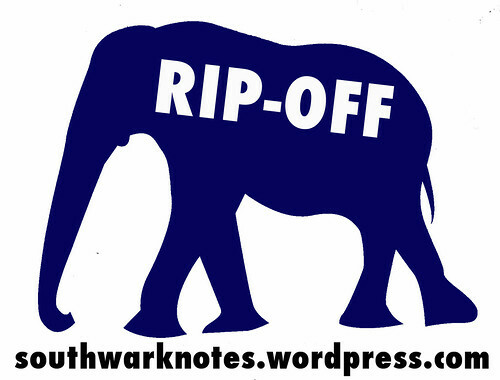 In The Elephant, the community campaigns have not been making clear demands to new more upscale businesses partly because this probably reflects it being an unresolved issue within London’s wider anti-gentrification campaigns. Partly, locally, this is out of sheer tiredness with keeping up with everything going on in the area. Maybe it’s because the carrot of a Labour government dulls a bit the fact that we actually want a whole lot more than just percentage peanuts of social rented homes? Partly again there is still over politeness to politicians, be they councilors or The Mayor. There have been attempts to make a Neighbourhood Plan of our area and that would enable us to make decisions about what kind of things we want to keep and what kind of things we want to see invested in around The Elephant. All good stuff but its slow work! One thing for sure though is that without thinking through and being clear on the above and if we aren’t clear about how to take on gentrifying businesses head on in line with our vision for the area, we will wake up in a whitewashed bland-o-rama! more LOLZ…on the old Heygate site…and that is why we keep going on about it!! Comments Off on The Curious Case of The Heygate Estate, Hej Coffee And A Hey Presto! IT’S NOT TOO LATE – The Aylesbury continues to resist. Support the Resisters! Posted on January 6, 2018 | Comments Off on IT’S NOT TOO LATE – The Aylesbury continues to resist. Support the Resisters! Lots has been happening behind the scenes on the Aylesbury Estate since last time we wrote about it. The Aylesbury Leaseholder Action Group and their supporters have been working tirelessly preparing the objectors’ case to present at the second Public Inquiry on the Compulsory Purchase Order (CPO) of a number of flats on the First Development Site (a section of the Aylesbury Estate), which will open next week, on Tuesday 9th January. As you might remember, in a landmark ruling the Secretary of State Sajid Javid had not confirmed the Compulsory Purchase Order for the First Development Site after the first public inquiry held in 2015. He wrote that a compelling case for the CPO had not been made by Southwark Council, on the grounds that the compulsory purchase would negatively impact protected groups such as the elderly, children and BME communities, and that the Council had failed on their Public Sector Equality Duty; and on the grounds that Southwark Council had not made enough efforts to negotiate with the leaseholders. Southwark Council contested the decision through, and after some to-ing and fro-ing within and outside the courts, it agreed to drop its judicial review if the Secretary of State held another inquiry, and so it was that a new public inquiry was ordered. It promises to be epic: starting on 9 January, it will run from Tuesday to Friday for three weeks. The whole collection of documents put together by the objectors has been made available publicly here (http://ouraylesbury.org/cpo/) . It’s a lot of documents, and many of them are very technical: the Objector’s Statement is a long summary (http://ouraylesbury.org/cpo/ objectorsstatementofcaseNOV201 7.pdf) and David Bailey’s statement is a powerful testimony from a leaseholder and his family that sums up all the issues that the leaseholders are facing (http://ouraylesbury.org/cpo/ dbailey.pdf). The bundle also contains statements from academics and professional people, including that of a surveyor who has developed a refurbishment plan for the site: (http://ouraylesbury.org/cpo/ simonmorrowproof.pdf). The public inquiry is open to the public and anyone can attend. Come along to show your support to the leaseholders – the proceedings can be dry, but the impact of a full public gallery on the inspector will be much greater than rows of empty seats. Let’s show them we are watching them closely! From Tuesday 9 – 26 January (but not on Mondays), 9:30 – 17:30, Southwark Council Offices in 160 Tooley Street, London Bridge SE1. Comments Off on IT’S NOT TOO LATE – The Aylesbury continues to resist. Support the Resisters! Southwark Notes members have been following the rapid-changing news from Ledbury Estate, down on the Old Kent Rd for a while. We were happy to meet some residents back in July after they invited us for a chat. We also attended the residents delegation to the July Council meeting where they put forward their ten demands to Southwark. We wanted to write something about the amazing campaign they all been waging for safe and secure homes but pressing time never allowed us to put pen to paper! Then, this week, the excellent Radical Housing Network has asked us to host this text about the ongoing struggle at Ledbury which we are happy to do so. Here at Southwark Notes HQ we don’t have much faith in Labour but appreciate the energies and arguments of all those working with Ledbury residents in their campaign. This week Ledbury residents demanded that Southwark Council’s Cabinet Member for a Housing and Deputy Leader Stephanie Cryan should resign. You can join that call here! Two months after Grenfell, 224 families in Southwark high-rises are preparing to be evacuated. No fire. Just the discovery that their blocks are completely unsafe. It was a 12th floor resident, in the wake of Grenfell, who raised the alarm about ‘compartmentation’. She sent pictures of the cracks in her walls direct to the Fire Brigade, sparking a chain of events which overturned the findings of all the council’s previous fire risk assessments and structural surveys. 24-hour fire wardens were put in place until the cracks could be sealed. But residents invited independent experts to continue investigating and this week the council finally confirmed their findings – that gas should never have been installed on the blocks. The independent surveyors also say it’s not possible now to make the structures safe but the council insists it will do so, and have costed this work at 100 million, apparently even before they have their own surveyors final report. A bombshell letter was delivered to tenants announcing that the blocks were the same as the Ronan Point blocks which collapsed killing 4 people 50 years ago; that the gas was going to be turned off immediately; and everyone moved out within weeks. Residents asked for a meeting with council leaders but they refused. They are on holiday. For residents who feel angry, betrayed and abandoned it’s not hard to see the similarities with Grenfell. Another estate run down prior to ‘regeneration’. Residents continually reporting problems being fobbed off by contemptuous officials, and cracks literally papered over. Years of poorly managed work by subcontractors. Fire risk assessments that failed to deal with risks. And still the ingrained methods of disrespecting council tenants prevail. A resident who asks about moving to a hotel is told haughtily that they can apply but they’ shouldn’t expect The Ritz’. Gas workers are instructed to break into people’s homes to cap their gas pipes without giving any notification. Council tenants have come to expect being treated badly. From Thatcher’s Right to Buy to the 2016 Housing & Planning Act, governments have attacked the ‘privilege’ of council housing for working class people and tried to force through privatisation, higher rents and less secure tenancies. Global speculators and developers made billions but for the rest of us, in private as well as public, there’s been rising rents, increased insecurity and homelessness, overcrowding and more substandard housing. A process for which Grenfell tower stands as testament. The Tories have no interest in reversing this process but could this be a turning point for Labour? 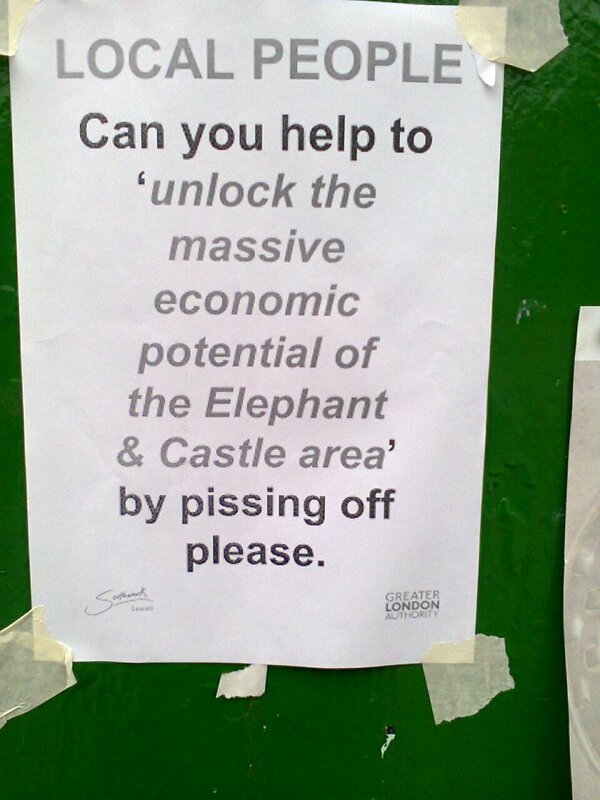 Southwark have been responding to some of the residents’ demands. They claim they want the estate to stay council and that leaseholders shouldn’t lose out. But they are also trying to manage residents’ expectations rather than defy the government’s spending or borrowing limits. They say they can’t afford to buy more flats immediately and that if they demolish they can’t afford to rebuild it as council housing. So tenants begin to weigh the risk of staying in dangerous blocks as preferable to moving into properties with vastly higher rents and losing their council tenancies, or moving out of their community altogether. When the council refuses to guarantee tenants will be rehoused locally in good quality council homes it is creating an atmosphere of fear, setting people in competition with each other, and preying on feelings of powerlessness to make people accept anything for fear of losing everything. So it comes down to the residents who are organizing themselves. On Sunday, after meeting on the green to draw up their demands, tenants marched to an empty new private development which has only 6% social housing. They do not believe the council cannot buy up these flats for council housing. They do not accept that the Government should not foot the bill. The residents are pointing the way and Labour in Southwark now have the opportunity to deliver.